Hanging Low and Invisible: What is with all the Purple Flamingos?!?! 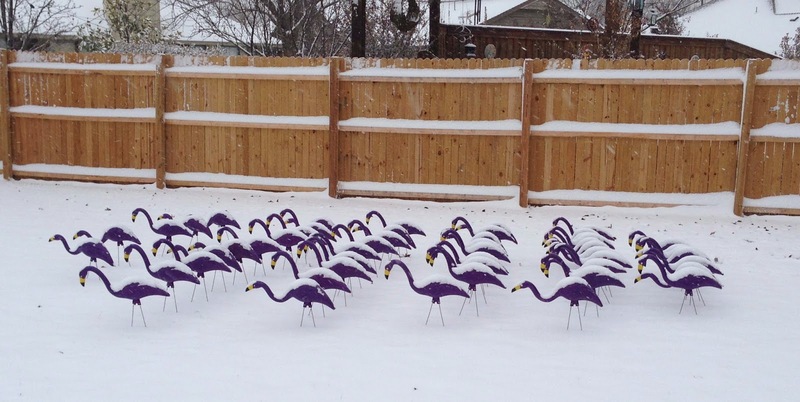 What is with all the Purple Flamingos?!?! **Note: If you are a homeowner with flamingos in your yard, please check the "info tube" on the sign. 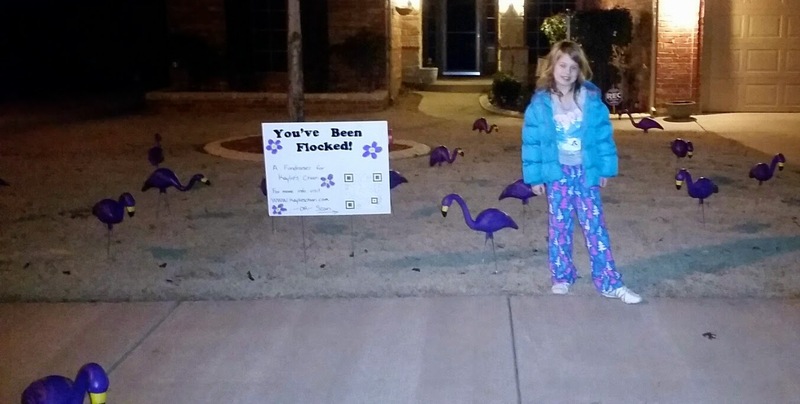 “Flocking for Kaylie” is a fundraising event to help support Kaylie Barnes. Kaylie is a 2nd grader at Truman Primary. 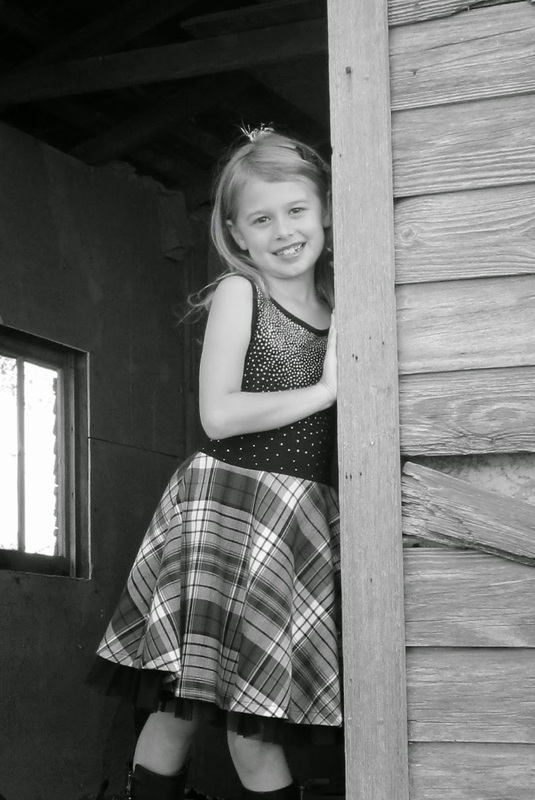 March of 2012, Kaylie was diagnosed with a brain disorder called Chiari Malformation (Kee-AR-ee). Chiari is a congenital anomaly in which two parts of the brain, the brainstem and the cerebellum, protrude through the opening at the base of the skull. She suffers from many symptoms of severe headaches, ear pain, eye pain, fatigue, light & noise sensitivity, clumsiness, and Aphasia (word finding, word retrieval and recall issues). Her parents sought out a pediatric neurosurgeon highly experienced in this condition and related conditions, which is at The Chiari Institute of New York. In July of 2012 she underwent a brain surgery, surgery was not a cure; it helps relieve some of her symptoms and the progression of this disease. Since the surgery things have gone well, till this year, some symptoms have returned, some new, and some a little different. This past fall Kaylie had a few different MRIs, which showed she has a related condition to Chiari. She has Retroflexed Odontoid Process, and will need a cervical fusion of the neck. On March 11, 2015, Kaylie will have this surgery. To help off set the cost of travel and medical bills we are fundraising for Kaylie. Why are the flamingos purple??? Purple is the Awareness color for Chiari & Related Conditions. Join us in a Flocking Fundraiser for Kaylie! If you live in the Moore/Norman area of Oklahoma and would like to “flock” a friend, please contact us here, and we will send you the order form for flocking! It is a $25 donation to flock a friend. Flocks may not migrate outside the Moore/Norman City Limits or onto public property or apartment complexes. Flocking is done in Good Spirits and is not meant to be malicious. The last flock will migrate North on March 1, 2015. Please pass on to your friends the excitement of being “Flocked”!!! And thank you for supporting Kaylie! You can read more about Kaylie on this blog, or you can visit her Facebook page “Kaylie’s Chiari”.